A young artichoke that I planted in my parents’ vegetable patch in Suffolk. I wrote this rather heated poem about sharing an artichoke last summer. from each petal of a globe artichoke with our teeth. 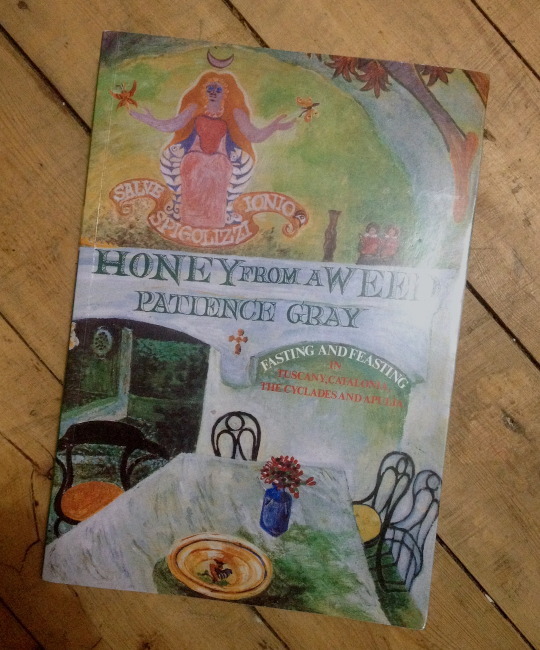 Anyway… Patience Gray’s Honey from a Weed: Fasting and Feating in Tuscany, Catalonia, the Cyclades and Apulia (1986) was written over the course of twenty years living with her partner, the sculptor Norman Mommens, whose need of marble and rock led them around the regions mentioned in her title. The book has durational quality that would be impossible to replicate had one not lived precisely as she did. It is beautifully illustrated by Corinna Sargood. There are several very good recipes for artichokes in the book. 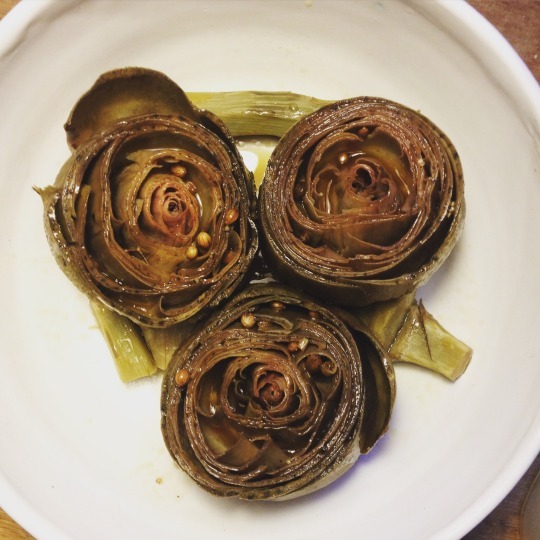 Around a month ago, when it was still spring and small, spring artichokes were available, I made Carciofi Vicentini with some bought from the grocer Cruson in Camberwell for 50p apiece. I am frustrated that those I planted early in 2014 when I was in Suffolk have produced splendid artichokes that I have still not tasted. Unbeknownst to me, they only produce the edible part of the plant in the second year, and I am largely stranded in the library finishing my thesis in London. Gray’s recipe for the small spring artichokes I bought was delicious (see below). Here’s the artichoke just after I trimmed it to the size Gray suggests. 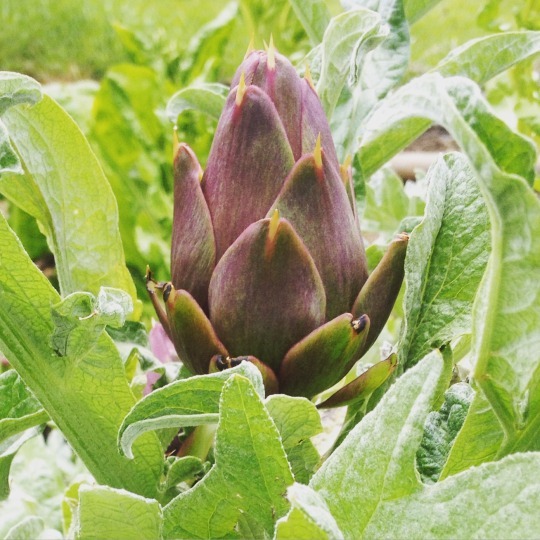 “Use small spring artichokes with succulent stems in early youth. Peel back the outer leaves, cut off about a third of the calyx at the top, and cut off the stems – pare the tender part of these and cut into small pieces. 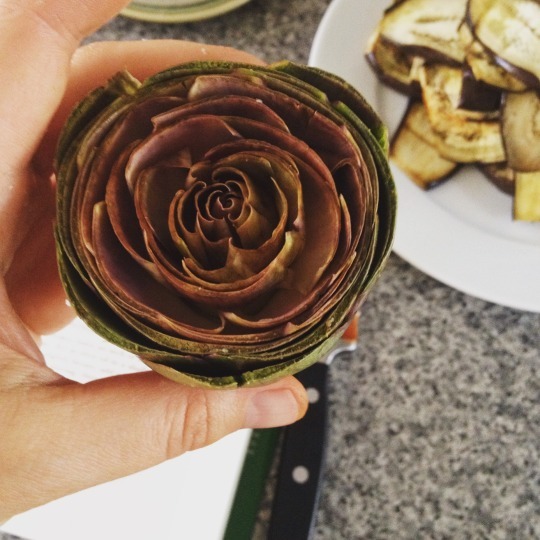 Open out the artichokes a little, gently. Wipe them with the cut halves of a lemon; this prevents discolouration. Fit them into an enamelled pan, bottoms down, putting the stems into the gaps in the pan between. Add water, but not as so to cover, then pour some olive oil into each of the slightly opened artichokes. Add salt, pepper, some coriander seeds, some leaves of mint, bring to the boil with the lid on, and cook vigoruosly for 20 minutes. The liquid will be partly absorbed and will partly evaporate. I did not have any mint, so just used coriander and it was still delicious. As a second course we had Aubergine Parmigiana and a green salad. I am very keen to try the artichokes fried with parmesan in the book. To finish, here is Chilean poet Pablo Neruda’s (1904-1973) ode to artichokes from ‘Elementary Odes’, which were first published between 1954-1959. The translation into English is below (not mine, I think it can be improved upon).